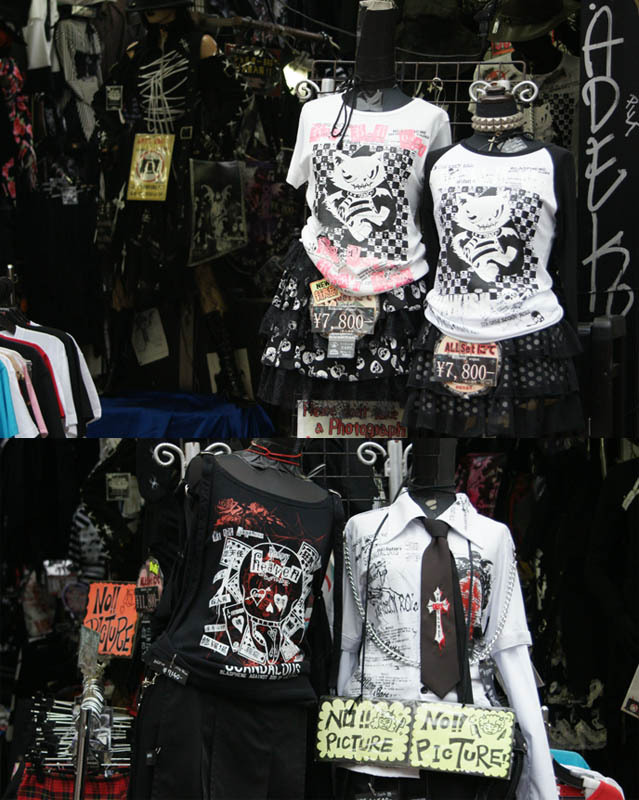 ALTERATIVE CLOTHING SHOPS IN HARAJUKU: MARI'S ROCK, RICHARDS, TUTU SKIRTS. 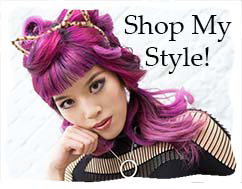 Mari’s Rock and Richards specialize in rock T-shirts, studded leather accessories, and casual garments (especially for men). 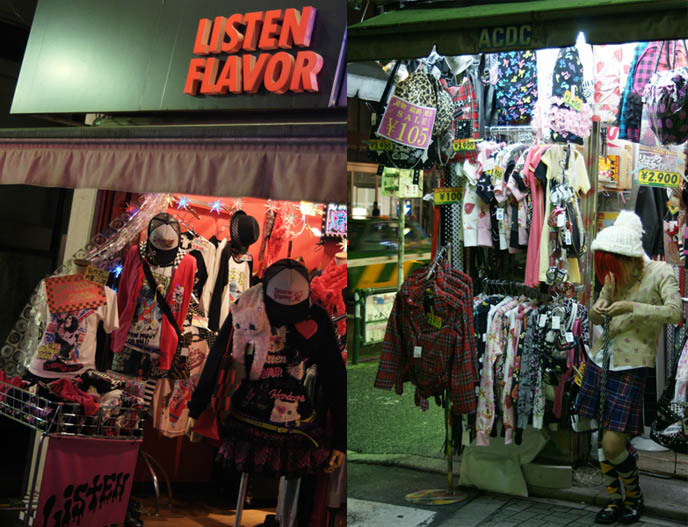 Listen Flavor (left) puts a neon electro spin on street/punk fashion. 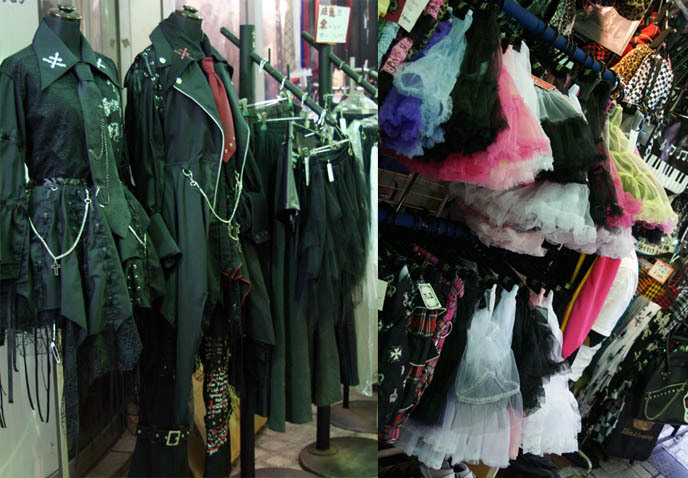 AC/DC (right) has a wide selection – and as you can see, price tags are generally under $30! Whenever you put up a Forbidden sign, you can pretty much bet that I’ll do it anyway. Inside, the “No Picture” signs also tell you to “F** Off”! 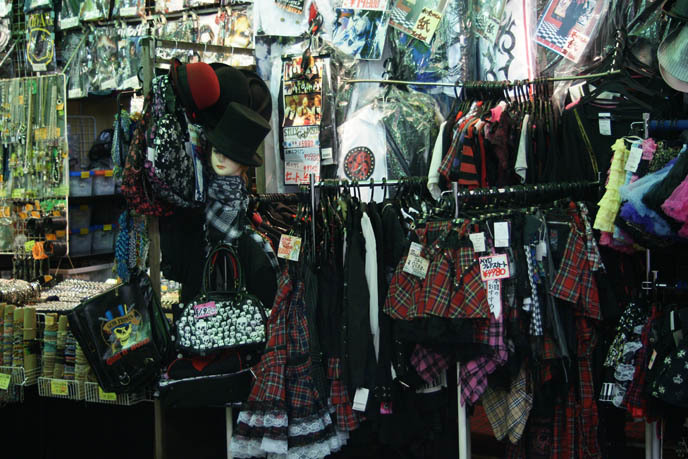 This looks similar to a lot of shops you can find in England (Camden or Birmingham/Manchesters alternative areas). Only here the shops will buy in a lot of the exact same cheap brands/stock so you don't get the fun of rummaging or finding anything really unique. I am slightly worried I am being drawn to the silver disc drag dress in your photos. 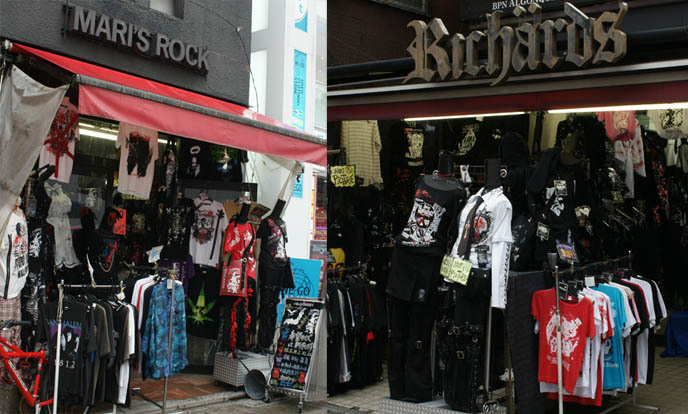 This looks similar to a lot of shops you can find in England (Camden or Birmingham/Manchesters alternative areas). Only here the shops will buy in a lot of the exact same cheap brands/stock so you don’t get the fun of rummaging or finding anything really unique. I also found a lot of great items in the store! My friend got a black mini backpack with bat wings – totemo kawaii! I can't wait to go to Japan!!! 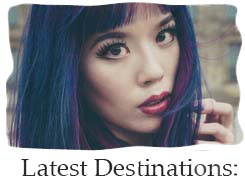 Are all these shops easy to find? I can’t wait to go to Japan!!! Are all these shops easy to find? Easy as apple pie. As soon as you walk out Harajuku station, they’re everywhere in sight! Don’t forget to wander down the side roads of the main street (Takeshita Doori). Oooh I will check them out and make them an upcoming Song of the Day! Easy as apple pie. As soon as you walk out Harajuku station, they're everywhere in sight! 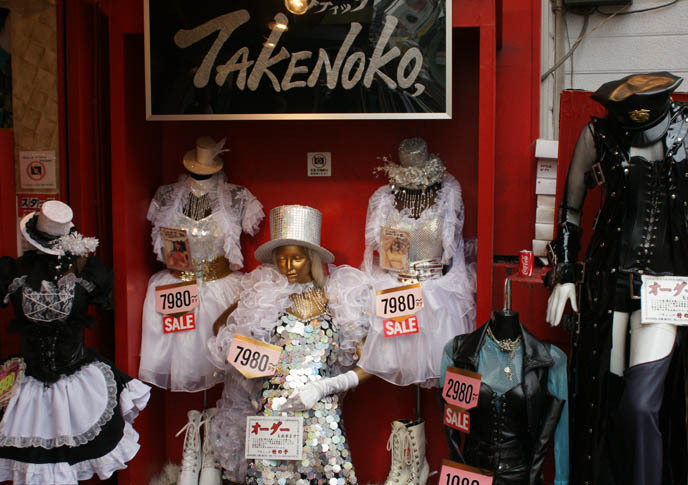 Don't forget to wander down the side roads of the main street (Takeshita Doori). 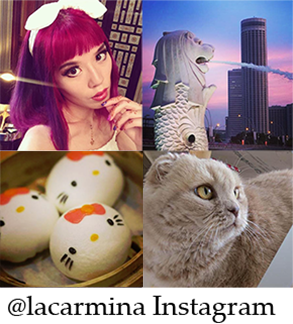 I have to agree with N. I know that photos can add colour and spice to a blog, but most stores in Japan do not want photos taken. Anyone who reads this blog can tell that you break rules, but if a sign said “Forbidden Entry-Quarantine” (for example) in a Biological Center or the like, would you open it? Basically, it's not funny or “kawaii” behavior. It's just needy. Oh well, can’t please everyone! Basically, it’s not funny or “kawaii” behavior. It’s just needy. AH!!!!!!!!!!!!!!!! THAT PLACE LOOKS SO AUSOME!!!!! Harajuku! Wish we had a wild fashion district like this in Melbourne. Though Japan isn't that far away I guess. Harajuku! Wish we had a wild fashion district like this in Melbourne. Though Japan isn’t that far away I guess.